STANDARD EQUIPMENT. Four-cycle Briggs & Stratton air cooled gasoline engine with "oil foam" air cleaner, 12 volt electrical system; electric starter generator; magneto ignition; key ignition, switch; pushbutton starting; 3 forward and 1 reverse speeds; drawbar; foot operated clutch and brake; foam rubber padded seat; foot rest; implement lift system with hand lift lever; implement PTO clutch operated from seat; Terra-Tire extra wide low pressure rear tires; removable hood. HIGH-STRENGTH STEEL FRAMES . . . DESIGNED FOR MAXIMUM TRACTOR STABILITY. Rugged, channel frames are of 10-gauge steel. Frames "dip down" at the ends to lower the center of gravity for maximum tractor stability and safety when working on hills or uneven ground. PATENTED FREE-FLOATING AXLE AND MOWER DESIGNS. On 10 and 12-hp tractors, the mower attaches to a free-floating axle. As the axle pivots over dips and ridges, the mower follows . . . always parallel to the ground for smooth, even mowing. The 8-hp tractor is integral with the frame . . . but achieves the same no-scalp performance with a patented free-floating mower. DEEP-DECK MOWER PREVENTS CLOGGING AND CHOKING. Allis-Chalmers mower attachments are 6½" deep . . . deep enough to permit large amounts of cut material to be exhausted without the mower clogging or choking up. CONVENIENT CONTROL PANEL. All controls are conveniently grouped for quick, easy access. These include a key ignition and on the 10-hp and 12-hp models push-button interlocking starter that assures safe, accident-free starts; a new push-pull throttle control with separate choke; an easy-to-read calibrated ammeter; and the gear shift control lever. FULL-CIRCLE STEERING WHEEL. Every Allis-Chalmers tractor has a deep dish, full-circle steering wheel for your safety and convenience. The 5.1:1 steering ratio assures quick, easy steering. HIGH-FLOATATION TIRES. All Allis-Chalmers lawn and garden tractor tires are designed for maximum floatation and traction. They apply less pressure per square-inch to your lawn than you do on foot. BRIGGS & STRATTON ENGINES. Built to our own exacting specifications. Exclusive Easy-Spin starting, a high tension magneto system and 12-volt starter/generator systems assure fast, positive starting. In addition, the 8-hp and 12-hp tractors feature Briggs & Stratton's exclusive Synchro-Balanced engine design that greatly reduces vibration to prolong engine and tractor life . . . and make your ride more comfortable. FAST, EASY IMPLEMENT HOOK-UP. Any Allis-Chalmers implement can be hooked-up in minutes . . . without tools. The 10-hp and 12-hp tractors have three power take-off points: front, center and rear. The 8-hp tractor has front and center PTO's. ARMCHAIR COMFORT. Backrest and armrests are comfortably foam-rubber padded and covered in tough, long-wearing vinyl. Extra-wide backrest provides comfort and support for the roughest terrain. EASY ACCESS TO ENGINE. Just remove four thumb screws and lift off hood. Entire engine, gas tank and battery come into view, ready for your inspection or routine preventive maintenance. ATTACHMENT LIFT SYSTEM. (10-hp and 12-hp only) Either manual or hydraulic control lets you raise and lower attachments right from the driver's seat. Also available: an optional right-hand lift control that lets you mount a second attachment. 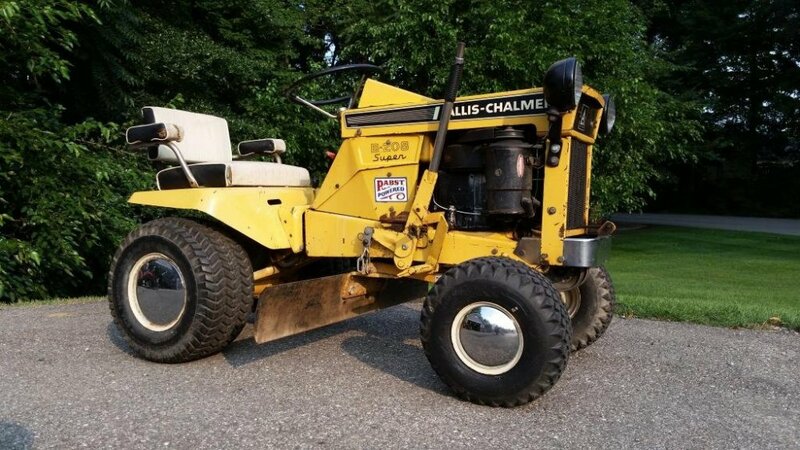 With this exclusive Allis-Chalmers feature you can switch from one lawn and garden job to another without switching attachments. EASY-TO-SEE FUEL GAUGE. The gas cap is the fuel gauge. You don't have to open the cap when engine is hot to determine the fuel level. HYDROSTATIC AUTOMATIC TRANSMISSION. (12-hp tractor) . . . puts an infinitely variable speed range at your fingertips. No clutch. No gears to shift. Moving the control lever adjusts tractor ground speed to match working conditions exactly. VARI-SHIFT TRANSMISSION. (10 and 12-hp tractors) . . . combines the fingertip ease of an automatic with all the direct-drive muscle of a manual. You have a choice of 7 speed ranges in any of 3 gear selections . . . constant speed control through 21 forward speeds. STANDARD 3-SPEED TRANSMISSION (8-hp tractors) . . . delivers optimum performance in each of 3 gear settings . . . just the right combination of speed and power to match nearly any lawn and garden job. The information contained herein is general in nature and is not intended for specific application purposes. Allis-Chalmers reserves the right to make changes in specifications shown herein or add improvements at any time without notice or obligation. A barn find from Michigan...a B-208 Super completely preserved from almost any use, with hubcaps and headlight kits, as well as 40" mid mount grader in original Allis yellow.